Last week I baked a batch of twenty-four yellow cupcakes. 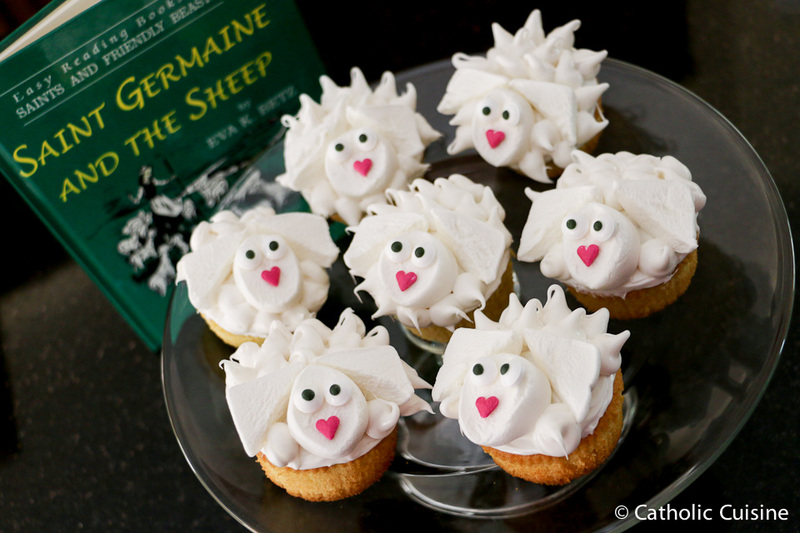 I decorated the first eight for the feast of St. Columba, eight more for the feast of St. Anthony, and this afternoon I decided to decorate the last remaining eight as sheep to go along with the story Saint Germaine and the Sheep for today's feast of St. Germaine Cousin who was a shepherdess nearly from infancy. You can read more about St. Germaine here. Originally I thought I would use miniature marshmallows, similar to our Good Shepherd Cupcakes, but we're out and I didn't want to make a trip to the store so I improvised with the last of the frosting and a round decorating tip. They turned out so cute! 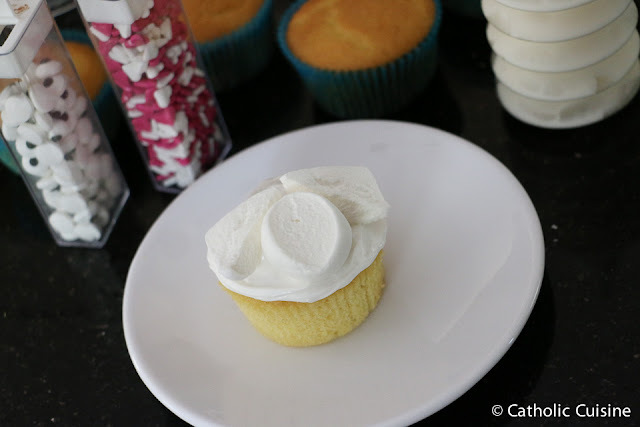 Unwrap each cupcake and frost top with Fluffy White Whipped Frosting. Cut the marshmallows to create face and ears for on top of each cupcakes. For the face: Cup marshmallow in half across the middle. 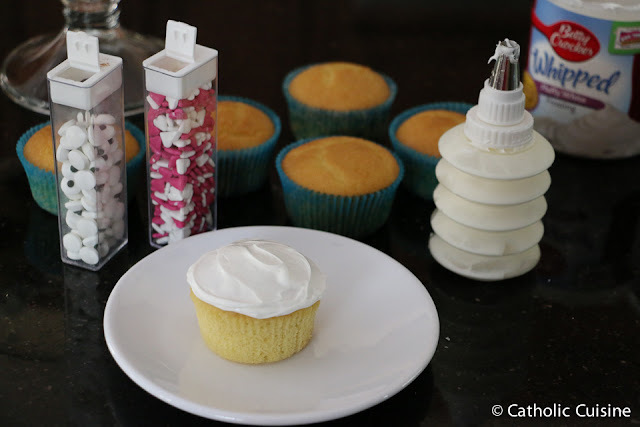 Use one half for each cupcake. For the ears: Cut marshmallow diagonally from corner to corner. 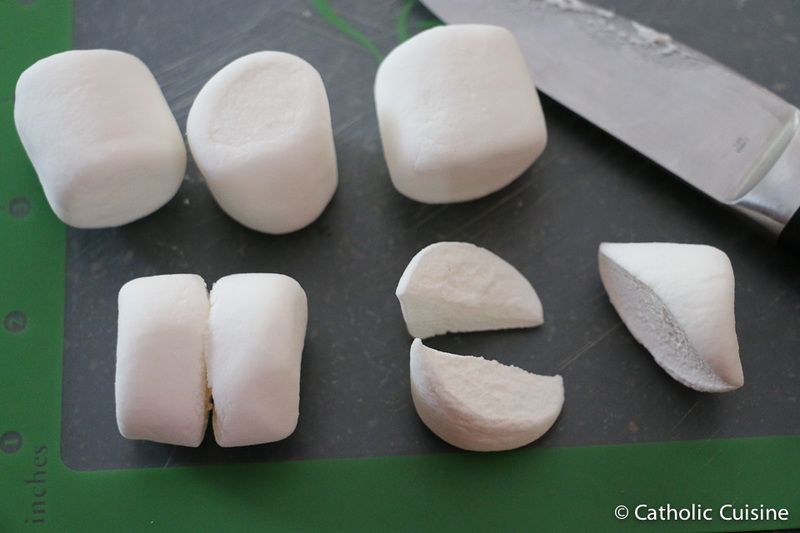 Cut one half of the marshmallow again, down the middle, to create two ears for each cupcake. 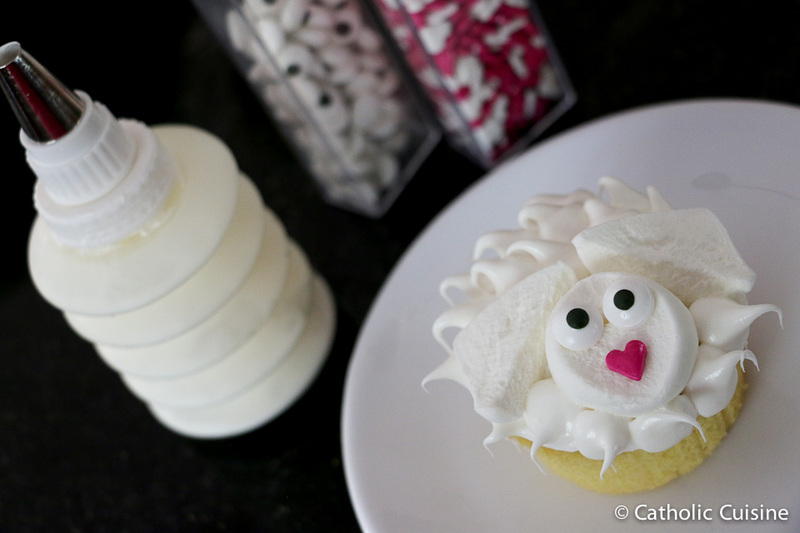 Place the marshmallow face and ears on top of the frosted cupcake, sticky side up. 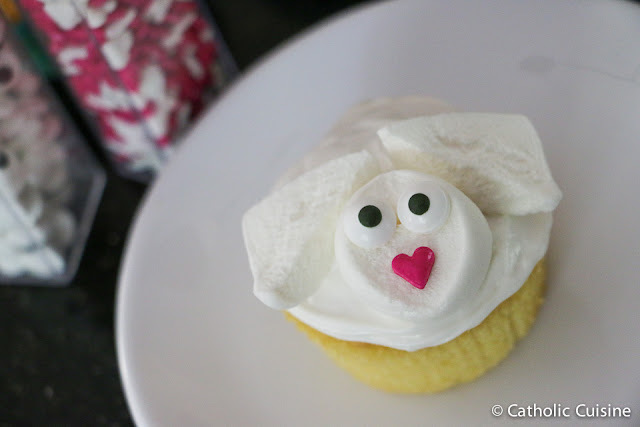 Add two eyes and a heart shaped nose to each cupcake. 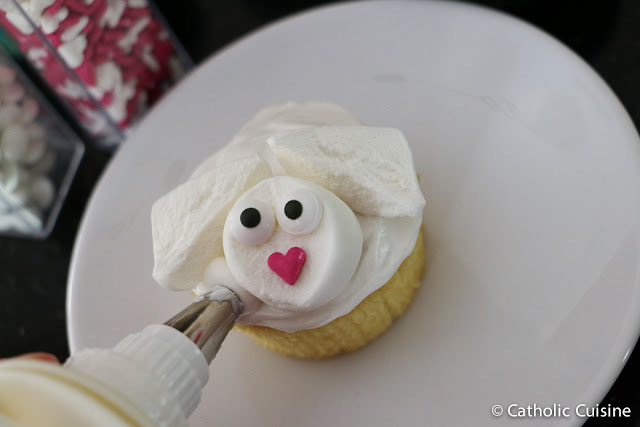 Using a round decorating tip, pipe dots of frosting around the face and ears, covering the top of the cupcake to create a fluffy sheep. You can find additional ideas for celebrating the feast of St. Germaine, including the link to a lovely coloring page, over at Shower of Roses. Saint Germaine, pray for us! The month of June is dedicated to the Most Sacred Heart of Jesus. The following recipe for Sacred Heart Quesadillas was submitted by Tatiana. Thank you, Tatiana! 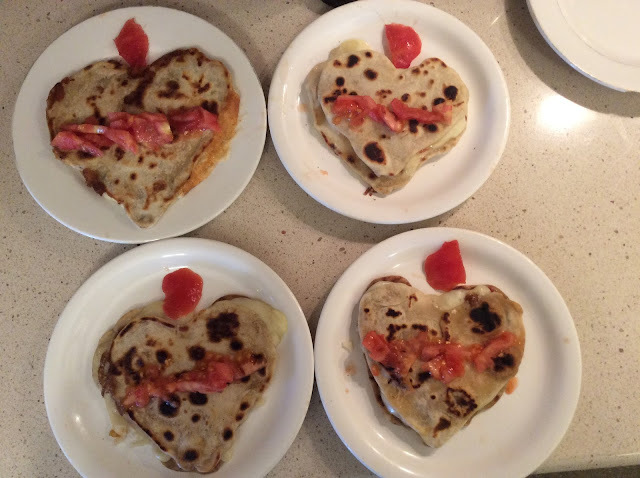 Inspired by the Holy Spirit, I made these homemade organic flour tortillas, cut with a cookie cutter, and decorated with what I had on hand...tomatoes. It is much easier to cut pre-made tortillas if in a hurry. Mix 5 tablespoons of soft coconut oil or butter into to 2 3/4 cups all-purpose flour until evenly distributed. Dissolve 3/4 teaspoon salt into 3/4 cup of warm water. Add water gradually flour until a dough ball is formed. Use your hands to knead. Add more flour or water as needed. Separate dough into 12 balls. Allow to rest for 30 minutes. Roll out as thin as possible. Use flour if needed. Cook on medium until it starts to bubble. Flip over and add cheese, cover with another tortilla that has one side already cooked, then flip over again as cheese starts to melt. Garnish with tomatoes in honor to recall the Most Sacred Heart of Jesus. Heart of Jesus, burning furnace of charity, have mercy on us! In a recent post for St. Mark's feast day I suggested a penne pasta dish for the pasta shape symbolism of quills. As shared then, there are hundreds of kinds of Italian pastas, and each one has its own special name and the names are usually symbolic to the shapes. 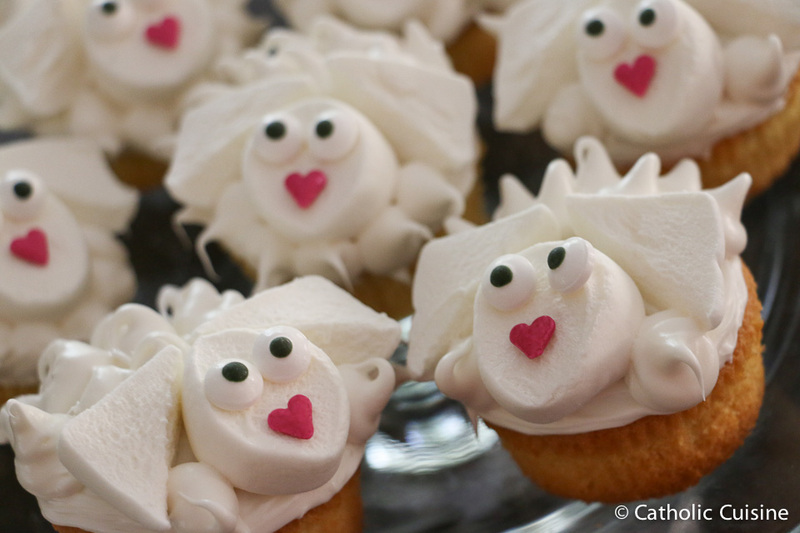 I am finding it fun to make a connections for creative dish or celebrations for saints and their symbols. Linguini is a long flat pasta, (thinner and more narrow than fettucine). Linguine means “little tongues” in Italian due to this shape. It is a versatile pasta and often used with a savory seafood sauces. In thinking of the significance of the tongue shape for any saints, I thought of several with a tongue association. St. Anthony of Padua, whose feast is June 13 was known as a gifted preacher. When his crypt was opened, they found that the saint’s body had been reduced to dust and bones, but his tongue was intact and life-like. This was taken a sign from God confirming the ardent gifts of preaching and teaching that Saint Anthony had enjoyed on earth. There are also a couple saints who are referred to as "honey-tongued" doctors - St. Ambrose and St. Bernard of Clairvaux. Pasta is a great option because it is quick to prepare and can be paired with a prepared sauce or simple seasoning and make an easy feast day meal or side. I decided to pair some linguine with pesto for a light side dish. In addition to being delicious pesto contains basil as a main ingredient. There is a custom in Italy of giving pots of basil away on St. Anthony's feast day and so I have come to associate basil with St. Anthony. Including a basil component to the linguine increased that symbolism, but any Italian sauce or flavoring would be appropriate for this beloved saint, who died in Italy. Thinking ahead to the other possible tongue symbol saints, a honey based pasta sauce seems fitting. So I hope you consider an easy side for St. Anthony's feast day - "little tongue" linguine in remembrance of his eloquent preaching.